Listen without prejudice. Jimmy Jax Pinchak is an actor, who tries his hand at blues rock. 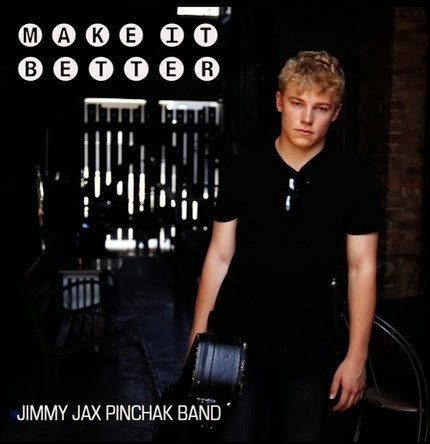 with a few choice player he formed the Jimmy Jax Pinchak Band, played a hanful of hsows and now he has released Make It Better, a rther short full-length showing his love for Cream and Stevie Ray Vaughn. It all sounds rather innocent and harmless. There is some good stuff - On The Run has the two guitars on separate speakers like they did in the Seventies and the live cover os Santana's Soul Sacrifice is nice with drummer Lael Eccard cutting loose in a good way. It's a an album that wil garner him a few spins on AOR radio for the novelty factor, and he wil unload a couple at the band's live shows. Make It Better i sa curio to showcase his love for his musical heroes. He should consider recording live - the studio can be scary place for a youngster with its endless takes and hassles killing the vibe. Make It Better is a self-released album. Buy it from the band's website.